After a three hour straight uphill climb, visitors entering Namche Bazar are greeted by a magical sight: a natural amphitheatre in which the fairytale town is nestled. The entrance has a recently installed row of water-powered prayer wheels, a neatly paved walkway, a brand new chorten and a water fountain to greet visitors. 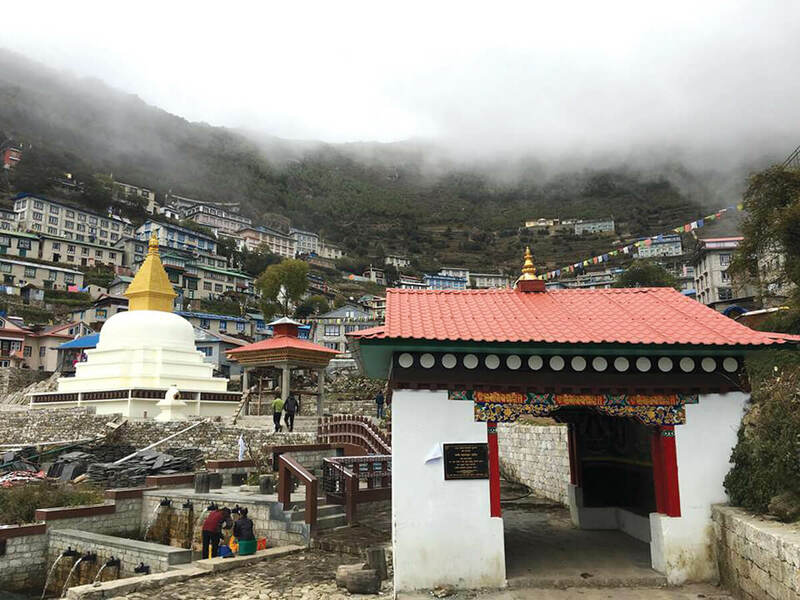 Namche Bazar has got a makeover that makes the famous town even more charming as it welcomed the first trekkers and mountaineers of the Spring 2018 tourist season. 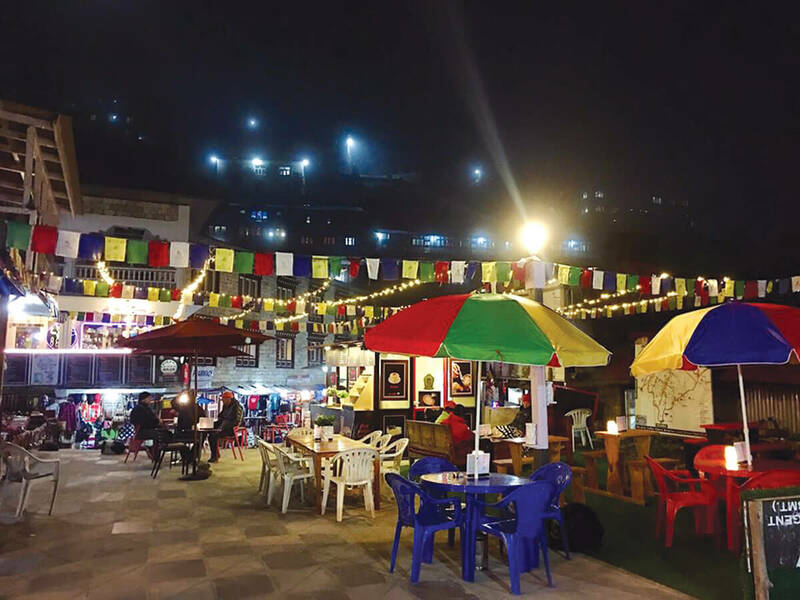 Along with the reconstruction, Namche has also upgraded its market area with new trekking shops, bars, bakeries, cafes, lodges and trekkers’ stores. International brands like Sherpa Adventure Gear and North Face as well as the local store Sonam have opened outlets giving the town a cosmopolitan look. Namche has always been a bustling stopover for trekkers and mountaineers going up to Mt Everest, Gokyo, or doing the Renjo La and Cho La traverses. At a time when even Kathmandu had only a few good bakeries, Namche already had three: Herman Helmers, Everest Bakery and Namche Bakery catering to tired trekkers. 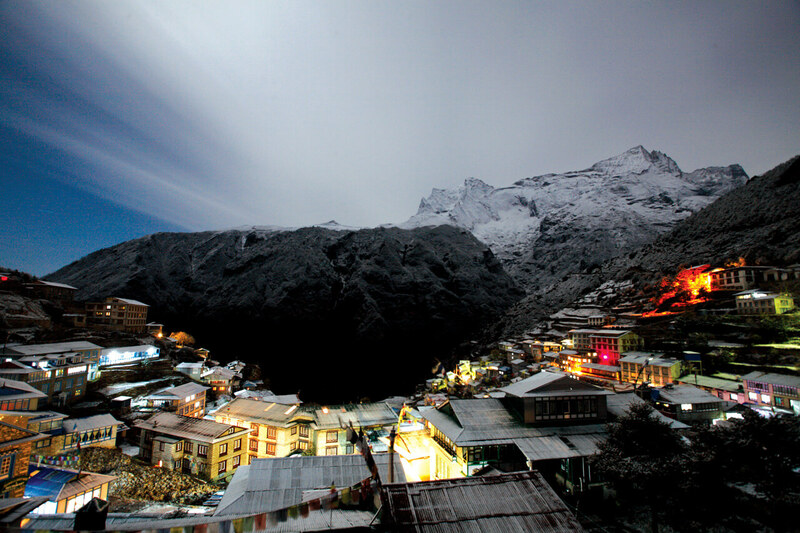 Some have unkindly dubbed Namche ‘Thamel on the Hill’, which does justice neither to Namche nor Thamel. Indeed, with newer additions such as Himalayan Java and a Japanese restaurant called Tomodachi, Namche is fast becoming more than just an acclimatisation stop, but a place to linger and enjoy the town’s unique ambience and setting. You can literally get high in Namche at the Daphne Bar, Irish Pub and Liquid Bar. After a tough trek to Base Camp there is nothing like lounging about at the Sherpa Barista, Café De 8848, Café Nirvana, Trek Away Café, Italian Lavazza and Illy for coffee and breakfast. Tourists also have a choice of over 50 lodges catering to all budget categories. More than the shops and cafes what is really remarkable about Namche is its strong sense of community, and the way the Sherpa people have adapted seamlessly to modern ways while keeping their traditions intact. The dynamics of the service industry have honed the legendary hospitality of the Sherpas. Khumbu now has a per capita income that is five times higher than the national average – an achievement that is not just due to tourism income but because of quality education, community spirit and remittances from the Sherpa diaspora which makes the people proactive, independent, hardworking and resilient. Locals here are organised, and there are management committees for everything from garbage collection, electricity production and distribution, town planning, drinking water supply and preservation of monasteries and cultural traditions. Local involvement in the Sagarmatha National Park has made it a model for the co-existence of tourism and ecological preservation. Tourism income is ploughed directly into development and nature conservation, and now with locally elected village council heads, there will be even more accountability. Already, local laws about seasonal harvesting of deadwood and ban on wildlife poaching have been effective in reviving nature in the surrounding mountains. 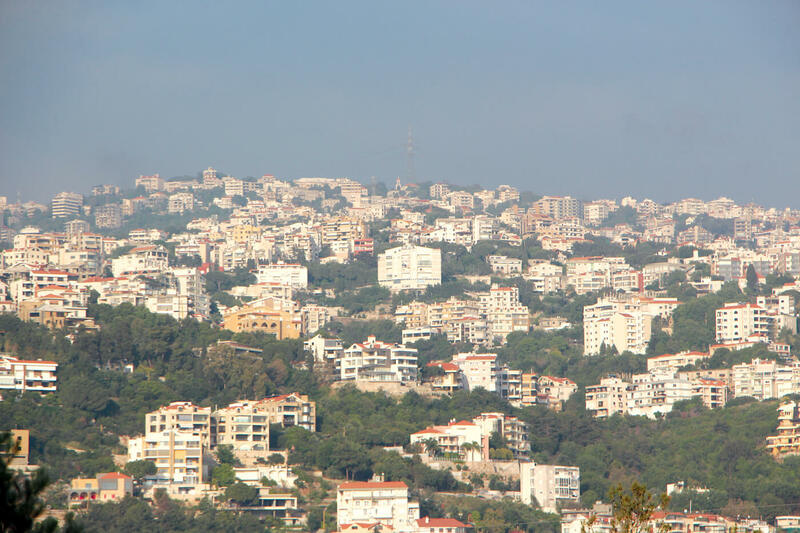 in waste management and cleanup programs. Namche has a community hospital now with fulltime doctors and nurses. The new village leaders want to turn their attention to upgrade the education system as it only has one high school in Khumjung. Namche has a reputation for being pricey, but that is because everything has to be either flown in to Lukla, or carried by porters and mules up from Phaplu. Unpredictable weather and transportation is a challenge for those running businesses. With the road network soon arriving in Surkhe, which is one day’s walk down from Lukla, many here think prices are bound to come down. Even before people fly to Lukla, they will have seen stunning posters of Namche Bazar and the Upper Khumbu in Thamel and other tourist spots. But few know the talented landscape photographer who captured those images: Lhakpa Sonam Sherpa, who has decided to stay on in his hometown while many of his contemporaries have left. His Sonam Photography images do justice to the dramatic scenery of the Khumbu with the highest mountains in the world, the deep valleys and forested mountain flanks. 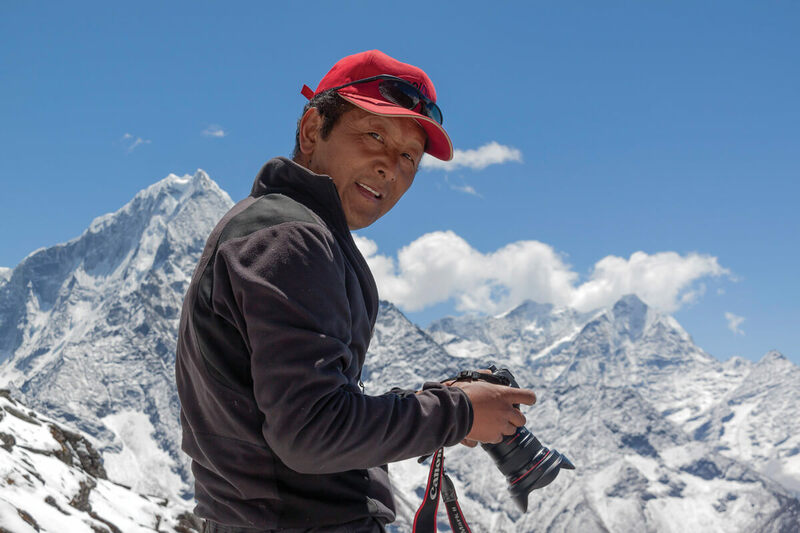 Besides his photography, Lhakpa Sonam is also the proprietor of Sherwi Khangba Centre in Namche, which has the Sherpa Culture Museum, Mount Everest Documentation Centre, a photo gallery showcasing Sherpa culture, a library and a hotel with authentic Sherpa hospitality. The museum alone gets more than 5,000 visitors a year and has become a mandatory stop for passing trekkers. Educated at Khumjung Hillary School, Lhakpa Sonam was not able to continue his studies after he lost his hearing due to meningitis. But this has not deterred him from his photography and the relentless pursuit of culture conservation. Inspired by his father who was a famous Sherpa climber, Lhakpa Sonam was motivated to start collecting information on Sherpa culture and the contribution of his people to Himalayan mountaineering. Although he joined several expeditions himself, he has always returned to photography and his hobby of collecting and preserving Sherpa artifacts. “When I lost hearing in 1980, after few years of hardship I began the cultural research work and started collecting old things which were mostly broken and also interviewed old Sherpa climbers most of whom had passed away by then,” Lhakpa Sonam recalls. 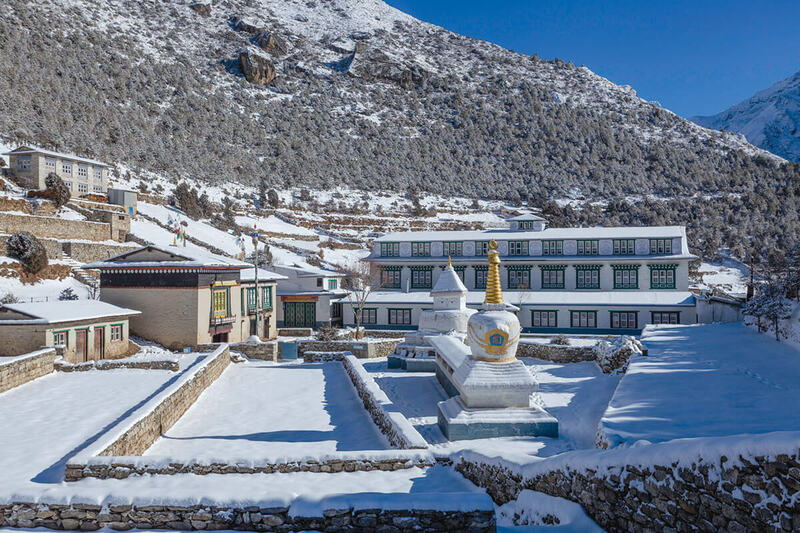 Sherwi Khangba is nestled above Namche’s busy hub in a tranquil and scenic spot with a traditional Sherpa house as the museum, a mani wall leading to a serene whitewashed chorten. Amidst the imposing ramparts of Mt Kongde and the fluted ridges of Mt Thamserku the hotel’s patio and spacious lawn soothe the tired body and mind. Lhakpa Sonam designed the awe-inspiring property himself, and worked with local carpenters to implement the landscape elements. 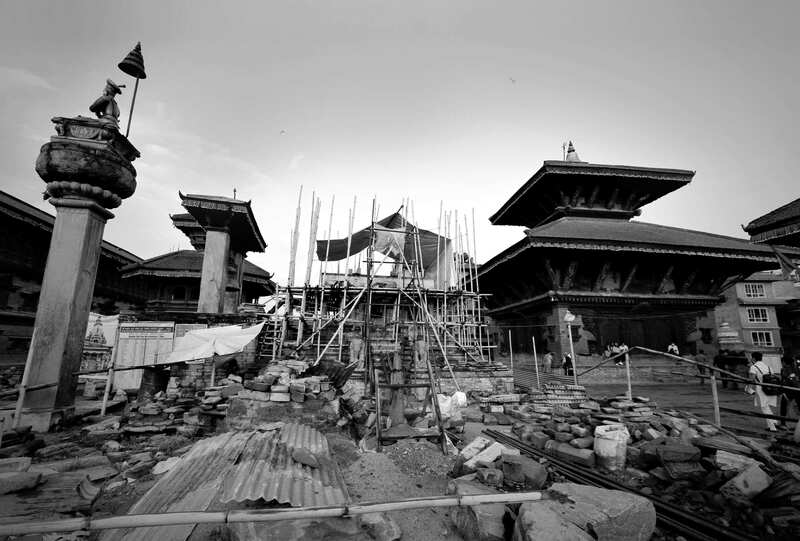 Lhakpa Sonam’s work is never finished, items to be preserved, rituals to be revived – especially when younger Sherpas are leaving the Khumbu and settling in Kathmandu or overseas. 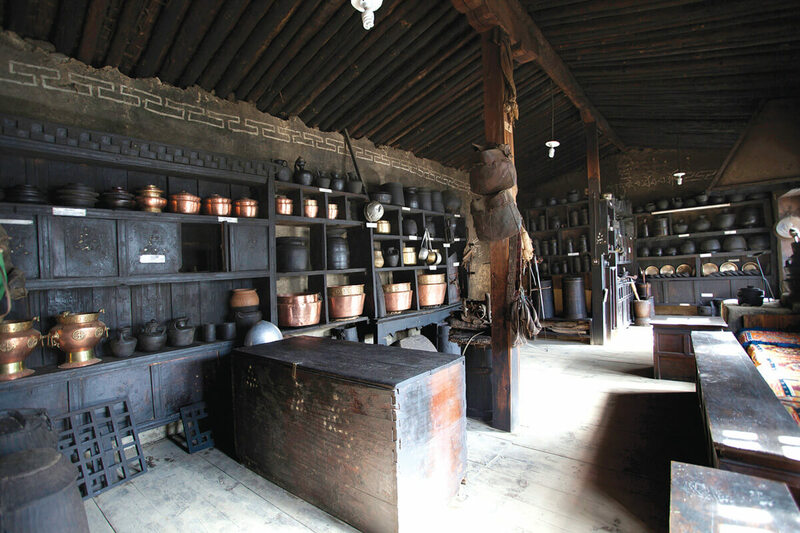 He is still collecting antique Sherpa household utensils, textile, and items that have nearly all but disappeared.